Let's design together with our technicians the display suitable for your needs of measures, image and costs. Assemble your display without the use of glue, nails or tools. In a few minutes it is ready for sale. 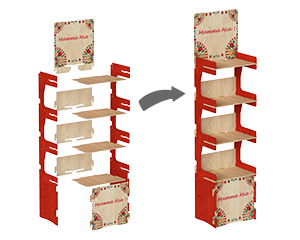 Receive the displays packaged singularly in flat pack (suitable also for the single shipment) placed on pallets. Look for a green label. You'll find the lowest prices on the market. The standard line is our best-seller in Italy and worldwide. 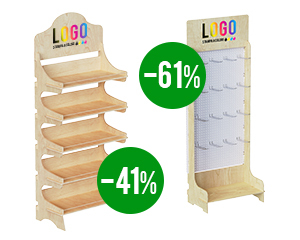 Alessandro Leccese presents CEMAB - wooden displays factory, trademark of international reference. All the production process is done in Italy. 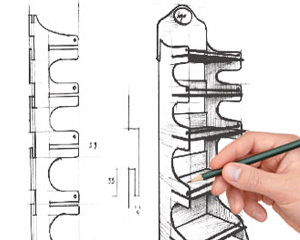 Cemab key to success - the interlocking assembly system guarantees fast and easy assembly without use of tools. Cemab team is here for you to make your project come true. Cemab offers standard displays line, with the shelves and with the hooks, suitable for any kind of product to be displayed. 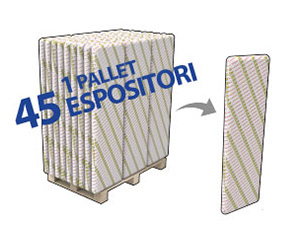 Interlocking assembly system of displays in flat pack allows to palletize up to 45 displays per pallet and reduces delivery / storage costs. Cemab products are 100% recyclable, made of renewable sources certified materials. Cemab is certified with ISO 9001:2008, today's hallmark of attention to the quality, service, product and relationship with the customers. Subscribe to our newsletter and get the bonus for your next order. Just contact us and we will answer to all your questions! Read the answers of our customers' frequently asked questions.